Share the post "[Data Visualization] THATCamp geography"
Since their creation in 2008 in Fairfax, THATCamps (The Humanities and Technology Camp) have multiplied in the United States and Europe. These user-generated unconferences challenge traditional patterns of transmission and sharing of technical and scientific knowledge within the “humanities“. Alongside the Paris THATCamp 2015, the organizers proposed a datasprint based on thatcamp.org site data. The following analysis questions the geography of these events, based on the the 247 THATCamp listed so far. A map of the 247 THATCamps listed on thatcamp.org, in 148 different cities (75% in the United States). Full size here. This timeline shows the same information as the map above, adding the time variable. On the time axis, cities are placed on the date of their first THATCamp (the number of following THATCamps is indicated when clicking). Mobile version here. This simple graph summarizes the information contained above. 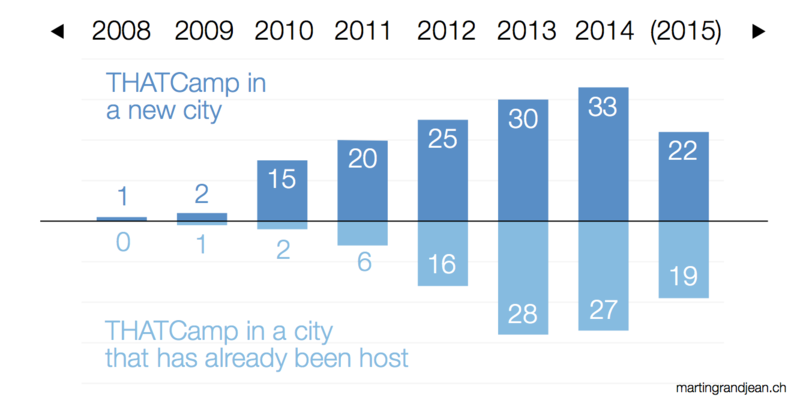 Fact: There are more THATCamps each year organized in a new city than THATCamp organized in a city that has previously hosted a camp. Aren’t THATCamps a sustainable dynamic? Or are they looking for diversity? Anyway, renewal is spectacular. Pingback : Data sprint ThatCamp Paris 2015 | Le guide des égarés.